BIG NEW Shiro Charms open for preorder in my shop! BIG NEW SHIRO CHARMS up for preorder in my shop! Preorders open until May 17th. This particular “briefs” design is a limited ONE-TIME exclusive preorder! It will NOT be reprinted. It is being produced with the express permission of the commissioner and is only available for this one preorder run. Grab him before he’s gone! UI/UX design by day, fan art by night. Zillabean @ Redbubble: Rainbow shark products! 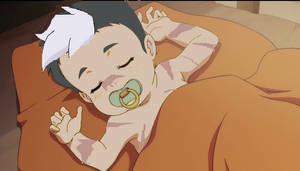 hey zillabeanie baby i made you a cute photo shop edit of baby shiro from voltron hope you like it also its really adorable hope you enjoy it since i made it for you after all. Hi! I know you get this a lot, but I honestly love your work and style! ( especially how you draw muscular men). I hope to be able to draw as good as you and commission you soon! I just wanted to stop by and say I love your art. Keep up the amazing work ok! hey zillabeanie i made your pillbug into a cute pokemon eevee and i hope you like the art i made for you. also its a friendship gift i wanted to make for you also i hope we can be friends and i made it to tell you how much i adore you as my idol and as my inspiration to draw and make art myself too.